Hands up who saw the huge cajon boom that we have seen in recent years coming. The growth of the cajon has been as rapid as it has been surprising. Not a single month goes by without several new models of these ingenious wood boxes being sent to Rhythm HQ. If you want to get in on the act but don't know where to start, you're in luck as we're here to help. For starters, if you believe that these unique instruments are a fad, think again. They've been around for a very long time and they can sound sublime whether you're replacing the sound of a full drum kit for unplugged situations or using them in more traditional Afro-Cuban or Flamenco settings. "There is a bewildering choice ofmodels on the market, so some careful selection decisions must be made." There are a great many sizes available and a huge variety of woods are used in their construction. When miked up properly from the rear of the cajon near the sound-hole - and even with a second mic close to the tapa (or sound board) - you can achieve incredible results through a decent PA system. Some companies even produces models with built-in transducers so you can just plug in and play without having to place any mics at all - very minimalist! 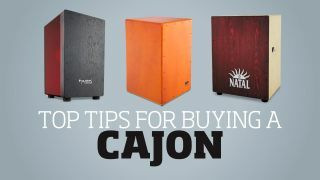 If you're serious about buying a cajon you should look for a model that's sturdy, able to take your weight easily and doesn't slip around as you play. Try to find one that has an easily adjustable and quiet snare mechanism for a variety of possibilities. There is a bewildering choice of models on the market, so some careful selection decisions must be made. Think about musical applications. Do you intend to play unmiked? Maybe you will always be miked-up and can plump for a subtler 'Cuban-style' model. Then there are heavier- duty models that project more and even fiberglass frontplated cajons that will be loud enough in unplugged sessions or super-beefy when played through a PA.
Ready to join the growing hoards of cajon players? Don't spend a bean until you've taken a look at our round-up of the best cajons in the world right now.